Sending an attachment from a common mailing server is almost impossible when the file size is larger than the required limits. Pando is using both peer-to-peer and client-server architectures to send and received large files. Server-assisted delivery: after the creation of an account on Pando's Website, the user is given the ability to send and receive a large file of up to 1GB. The delivery can be ensured thanks to this assistant with a report after each complete sending. File transfer: Pando enables to upload, download and send large files as attachments in a matter of clicks. A copy of these files will be uploaded to its servers and remains there for a certain period of time. Encryption: this application is using a 256-bit end-to-end encryption to secure all file transfers, whether upload, download or email sending with attachments. Pando offers a complete security among peers. 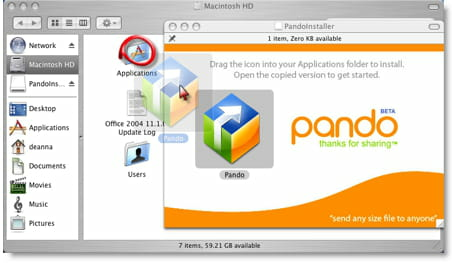 Pando is a program that can be downloaded free of charge. The utility is lightweight and consumes little resources in RAM. It is a multiplatform program. A subscription is required to profit from larger GB. Latest update on December 10, 2014 at 08:57 AM.